When I feel a bit tense or experience a small change in blood pressure and there is climatic change then red spots appear on my body. My body temperature gets drastically raised after few minutes and I get a feeling like I am falling sleep. My body returns to normal condition in 10 to 15 minutes. 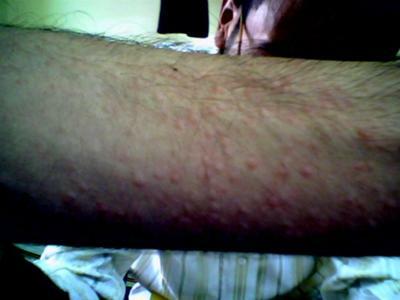 A picture of my skin allergy rash is above. Now my friend could benefit a lot from this topic. She is the one who is into all sort of cosmetics, beauty and health care. Last time when I met her, she was talking about something similar to rashes too. The bumps look like what I have had in the past but the symptoms are not the same. My rash was just very itchy. This is exactly what happens to me. How did you treat this?